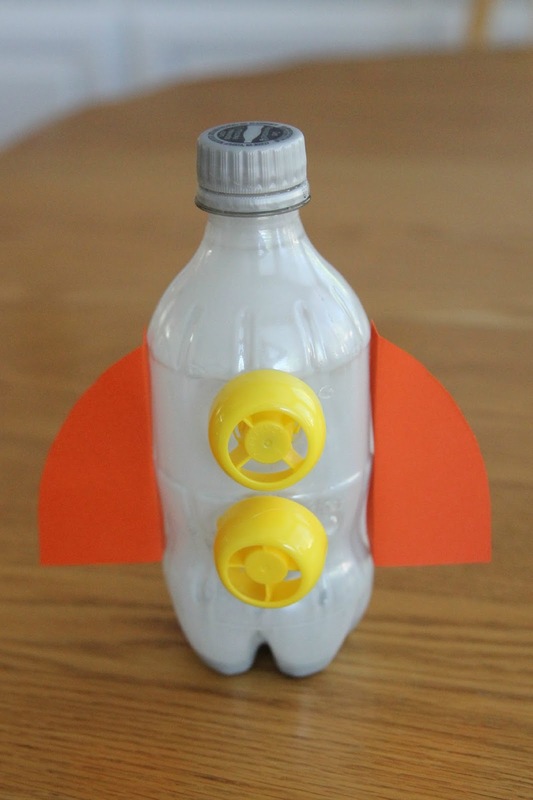 For Space Week we've had fun making an Astronaut photo helmet craft, a simple craft stick American flag, and a Puffy paint rocket craft. 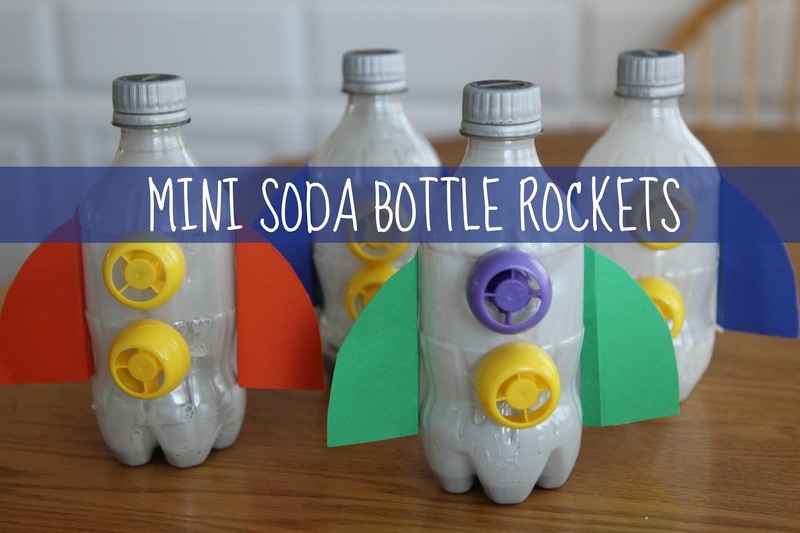 Today we decided to use our surplus of mini diet coke bottles (I am an addict) and food pouch lids to create our very own mini soda bottle rockets. These are super easy to make and they are the perfect size for little toddler hands. 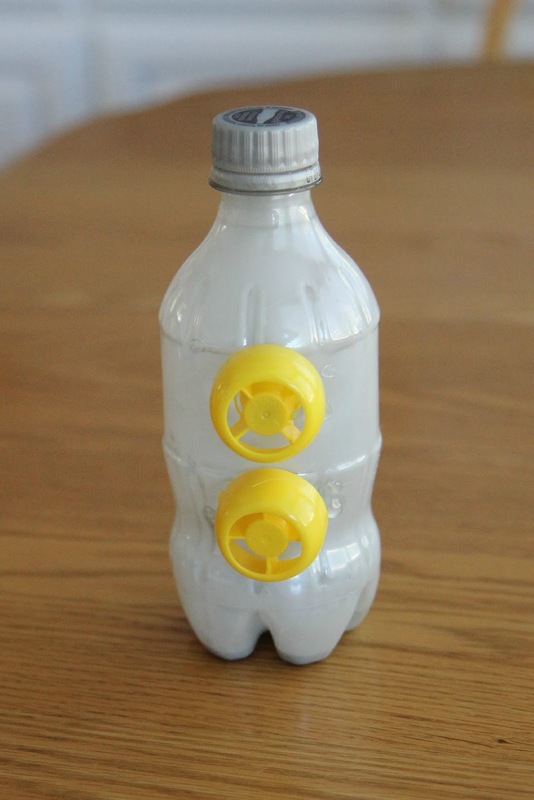 To get started you'll first want to color your mini soda bottles!! We added silver and a little white paint inside our rockets and started coating the insides of the rockets by moving the bottle around. My toddler was a rock star at shaking and moving the paint around to make sure that every ounce of the inside of the bottle was covered with paint. Next I used a hot glue gun to stick on the food pouch tops. They needed A LOT of glue to stay secure, so I applied it liberally. You can either just do this part yourself or have your child help you with the hot glue gun. Here are some of Teacher Tom's thoughts on kids using a glue gun... I'm still deciding how I feel about it but think I should try it. 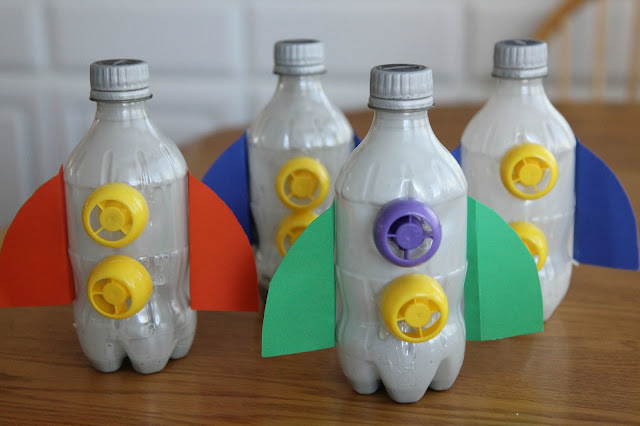 Next we added wings to the rocket but cutting some simple triangles and folding them so that they could be easily stuck to the mini water bottle. We couldn't stop with one and decided to make a whole collection! Man these were fun to hold on to and grab while running around and trying to make them "launch" into the sky. In addition to playing with our rockets we did a few other rocket crafts and activities and even sang our favorite Zoom Zoom Zoom rocket song. 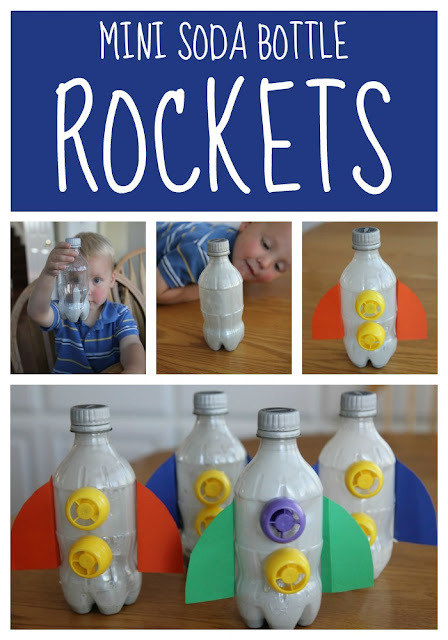 Do you have any favorite rocket activities? Make sure to follow along with Space Week to keep up with the other fun activities we share.